This is the third in a three-part series related to managing financial risk associated with timberland investments, wood procurement and forest management activities. Part I of Managing Financial Risk in Forestry (Real Options and a Practical Question) summarized efforts related to using financial derivatives in the forest products industry and timberland investing sector. Part II, To Hedge or Not to Hedge, introduced the concept of hedging risk in forest and timberland management. This post, Part III, discusses the pricing of options and use of supply agreements to manage timber prices. Wood procurement managers at sawmills, pulp mills and wood bioenergy projects seek stable or predictable wood flows at low or predictable prices. In that sense, wood procurement manages wood flows with cash flows. Tools or strategies that improve the control over these wood flows at no additional cost or reduce wood costs with minimal impact on wood flows are desirable. We can picture this both as a portfolio of activities and menu of alternatives. In developing risk management strategies for forestry investments, I modeled the application of “options on forwards” for wood procurement systems and supply agreements. These models build on the work of Black-Scholes (1973). In 1976, Black extended applications to cover commodities, such as agricultural products. In 1985, Thorpe developed a model to price options on forwards, which, by default, accounts for logistical issues associated with forestry operations. Why were these developments important? Because in forestry and timberland investing, we must wrangle imperfect data and irregular trees into standardized contracts. “Options on forwards” represent relatively flexible contracts that actually account for the time required to drive a load of logs to a mill. What did we learn? First, “valuing” and “pricing” options on forward contracts for timber applications reflect two different exercises. The fact remains that available timber price data and the irregularity and localized nature of timber values challenges the capability of standardized financial models. 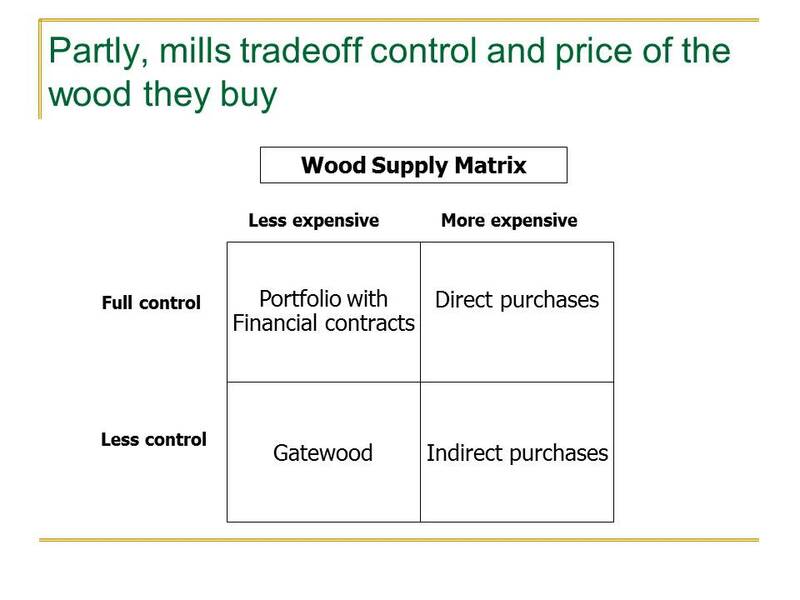 In the end, pricing options in forestry, while guided by models, includes negotiation. Second, valuing options in forestry supports efforts to price wood supply agreements and insurance-based strategies. When, as Mother Goose implores, we “try to find” remedies, we generate new alternatives for managing risk that may include operational and other readily available approaches. For example, option pricing helps us evaluate the costs and benefits of building or buying wood yards and the length of wood supply agreements. Finally, option modeling provides a useful benchmarking tool. Timberland-owning firms and investors may work with sufficiently long time horizons – typically 10 years or more – to mitigate log price exposure by adjusting harvest levels with log price levels. However, these same firms may require short-term regular cash flows, and hedging can, in theory, reduce cash flow volatility. This is especially true for wood procurement operations, where daily, weekly and monthly wood raw material needs drive the schedule. Isolating transactions and exposures that may result in variable cash flows provides a basis for evaluating risk management and hedging alternatives. Since 2003, Dr. Brooks Mendell has delivered keynotes and workshops throughout North and South America, in English and in Spanish, related to risk management in forestry and timberland investment markets. To schedule Dr. Mendell for your event, please contact Heather Clark at 770.725.8447 or hclark@forisk.com.